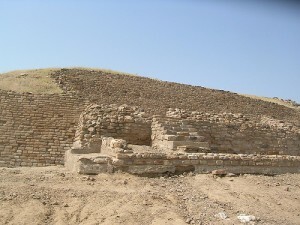 Harappan civilization in Gujarat of Ahmedabad district is known as Indus valley civilization. Around 2500 BC, the Harappans probably started infiltrating into Kutch and settled down there with an amazing speed and strength. 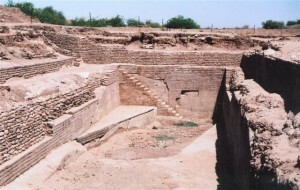 Of all the Harappan sites the site of Dholavira locally known as Kotada, in the Khadir island of Kutch, stands apart. It is a small village situated near the northwestern extremity of Khadir, which is a large island in the great Rann of Kutch. The village is approachable from Bhuj via. Rappar by a good road on which plies a regular buys service. It is remarkable for its magnificent planning and enormity of area and deposit.On the present showing, it is one of the two largest settlements in India and the fourth or fifth largest in the subcontinent.No wonder, if it was the metropolis of the entire Kutch or even a larger area. Dholavira enjoys the unique distinction of yielding an inscription of ten large signs of the Harappan script: indeed the oldest sign-board of the world, A variety of funerary structures is yet another feature of exceeding importance throwing new light on the socio-religious beliefs, thereby indicating the presence of composite ethnic groups in the Indus population of Dholavira. This entry was posted in Dholavira, Gujarat and tagged gujurat, harappa, harappan, harappan civilization, harrapa, indus, indus valley, Indus valley civilization, indus vally, mohenjodaro. Bookmark the permalink.